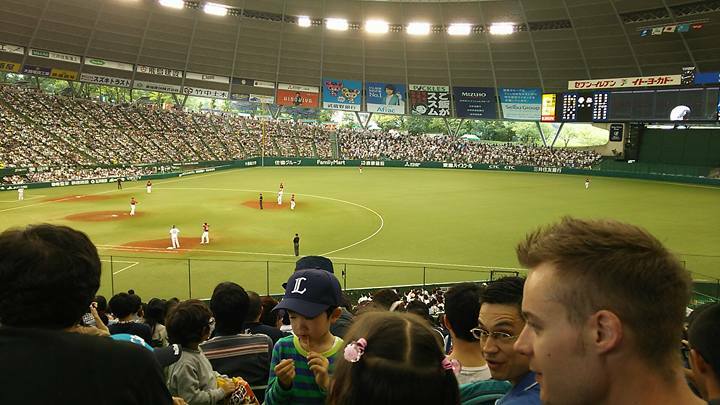 I went to Seibu Dome and saw a game between Lions ad Rakuten with my school's students, teachers and their children. Actually, I haven't been here since I was in primary school. They didin't have a dome at that time. So I couldn't see games twice because of the rain. It was a sad memory. But they have the dome now, so it's OK.
We got seats woth a great view. We were so lucky. We all supported Loins together. It was really exciting. Shoutout victory！It was a great game. Besides, today was retirement day of Morimoto！Seibu held a his retirement ceremony after the game. To be honest, we wanted to see it, but we decided to avoid a full train. The students were able to talk with teachers a lot. It was a great occasion to have a conversation in English. I'd like to participate this event next time too.